The path to Ironman Lake Placid was long. It was really long. Like, we went through more than a dozen toll booths and drove all day to get there. Like last year, I followed Don Fink’s 30 week training plan. I didn’t follow it exactly in that I skipped workouts each week, I made up my own swim workouts and generally, if life got in the way, training would usually get pushed aside. In all, I did 227 workouts during the 210 days of the program and took off on 29 of the 30 Mondays. I ran for 100 hours, 34 minutes and 6 seconds covering 707.56 miles. I rode for 155 hours, 8 minutes and 56 seconds covering 2,837.92 miles. I swam 29 hours, 1 minute and 8 seconds and covered 132,342.39 yards. Taken together, the training was approximately similar to 26 Ironman races. Of all my exercise time between the start of the year and the end of the race, only 3.7 percent was actually during the race. The rest of it was preparation. The training took nearly 285 hours or about 11.9 days. This doesn’t count driving to and from the pool, changing clothes, sorting gear and preparing nutrition for long workouts. It doesn’t include transition times during brick workouts. It is a proxy however for the sacrifice and trade offs required. June was the biggest month of training with 157+ miles running, 616+ miles on the bike and another 26,797 yards (15.2 miles) in the pool. I lost about 16.4 pounds if you take my average weight from January and compare it to the average weight in July. I raced about seven pounds lighter than the 2012 version of IMLP. I went through more than two pairs of running shoes, a set of tires, a chain and rear cassette and at least three really big orders of Gu, Bonk Breakers, Perform and Powerbars from TriSports. I also missed at least three (perhaps four?) of the kids’ swim meets and made the family late for any number of activities as they all waited for Papa to get home from a ride or long run. Thankfully, all of this took place without injury or accident. No wrecks, pulled muscles or other major setbacks. It is a cliché, but true: Half of the race is simply getting to the start line healthy. I won’t be at the start line for Ironman Lake Placid 2014. Two years in a row is enough for me and the family. But I’d like to go back. I don’t plan to do an Iron-distance race next year. Instead I’ll focus on more of the 70.3 races. I’ll focus more on what is happening at our house where I’m loved and I so dearly love others. 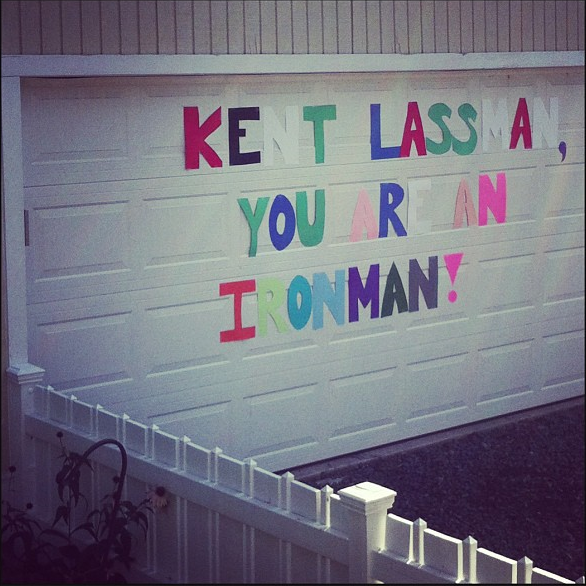 The Homecoming Committee let the whole neighborhood know. We will do it all again when you’re ready. It is a privilege to watch you train and compete, and an inspiration to all of us to lead fuller, edgier, more dedicated lives. You’re a badass! Ok, if that isn’t just the most precious sentiment, the post and Dana’s response. I don’t really even know you two and I love you.